Jane Isay has been an editor for over forty years. She discovered Mary Pipher’s Reviving Ophelia, commissioned Patricia O’Connor’s bestselling Woe Is I and Rachel Simmons’ s Odd Girl Out, and edited such nonfiction classics as Praying for Sheetrock and Friday Night Lights. She’s written several books of her own, including Secrets and Lies, Mom Still Likes You Best, and Walking on Eggshells. She lives in New York City, not too far from her children and grandchildren. 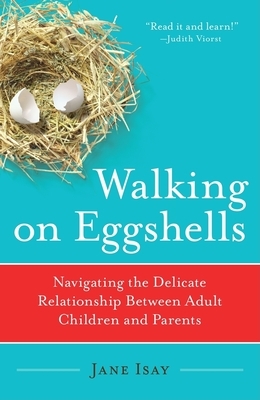 "The brilliance of Walking on Eggshells lies in Isay's uncanny ability to keep our love and good intentions in focus so that we all— parents and adult children—can untangle the unhealthy knots in our relationships before they cause harm." Are you envious when you watch people you know with their grown kids, or with their parents? Sometimes people put on a good face, but most parents wish they could be more at ease with their kids, and most grown children wish their parents would change their behavior. What do you wish you could change about your child/parent? What annoys you most? What makes you happiest? Are you closer to one parent than another? Are you closer to one child than to the other(s)? Walking on Eggshells shows that no person in the family has the same degree of ease or tension with the others. Tell some stories about these differences, both from your family and your grandparents. Do you wish you could improve the relationships between the generations? Everybody has done or said things they regret, and this book tells stories of occasions when people apologized or changed their behavior. Has this ever happened to you? Is there something you want to apologize for? Isay has found that guilt for past behavior drives a wedge between the generations. Has this happened to you? Do you feel judged too harshly by your parents? Do you feel let down by your children? At some point, parents have to adjust their expectations to the reality of their grown kids' lives, and adult children need to begin to see their parents as just plain people, flaws and all. What has happened in your life to make you adjust to the reality of your parents/children? If you've had to adjust, did it improve your relationship? If you're a parent, how did you feel when your parents told you what to do? If you're an adult child, what impact did your folks' advice have? Walking on Eggshells advises that no advice is the best advice! Think and talk about the suggestions you made or received that you appreciated, and the ones that you resented. Think about how they might have been phrased better to make them more acceptable. Do you belong to a family where the parents have been divorced and remarried? How do you deal with stepparents/stepchildren? Isay has found that it is not easy to form an old-fashioned family when the new relatives are all grown. Adult stepchildren especially resent the new parent, and new stepparents often take this personally. What is your experience with your stepfamily, and what do you think could be done to improve the situation? Or is it hopeless? How do you get along with your in-laws? How does your spouse relate to your parents? Is there something you would dearly love to change in this relationship? Sometimes stereotypes are correct, and some mothers-in-law are awful, but Isay has found that there are plenty of families where the generations really get along. It just takes a lot of tact and self-control to lay down the foundation of these relationships. What would you change in your relationship with your in-laws? Do you spend enough time with your grandchildren? Are your parents helpful with your kids and do they respect how you are raising them? It's not easy for parents to see their grown children raising their own kids differently from the way in which they were raised. What do you think about this, and how would you explain what you really feel to your adult children or to your parents? How do you deal with money? Some parents want to help their kids equally; others help the ones in need, if they can. There is often resentment on the subject, and people are confused about how to handle it. There are no easy answers. What do you think about this? How does your family deal with the issue? If there were one thing you wanted to hear from your parent/child, what would it be? If there were one thing you wanted your child/parent to hear from you, what would it be?